The glassware you choose to pour your cocktail in is as important as the ingredients you use to make your cocktail. It will not make it taste better, but it sure will make it look better. The amount of glasses you can use are endless. You can get as creative as you want, but most glasses have a specific cocktail they are paired with. 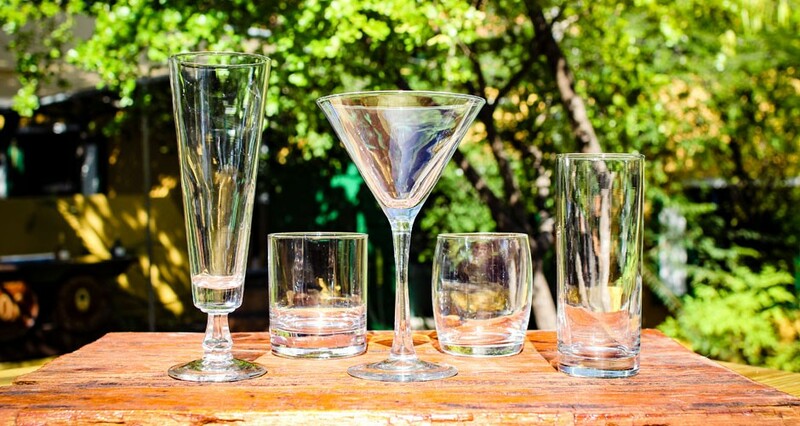 This list shows you the most important glasses you need to have in a home bar. The look of this glass tells it all; its small and tall design makes it perfect for long drinks. Since long drinks tend to be quite simple, the rounded plug at the bottom gives it an extra oomph to make it look more special. This glass, once very popular, is now making a comeback together with the long drinks. An Old-fashioned is the more posh version of a Rocks glass. This glass is more luxurious and has a thick sturdy base. There are two types of old-fashioned: the traditional and a double old-fashioned. The traditional one holds 8oz, while the double holds 14oz of liquid. Cocktails that are served in an old-fashioned, are cocktails that are also built in the glass itself. This means that you do not need a shaker. As the name says it all, this V-shaped glass is traditionally used to serve Martini in it. This glass is also known as a Cocktail glass simply because it is the most iconic symbol in the cocktail hemisphere. Its sleek design gives cocktails, like a Cosmopolitan, the city chic vibe it requires. A Martini glass should be no more than 7oz and should always be chilled before serving. The next question is: shaken or stirred? Cocktails like Caipirinha, that requires muddling, are best to be made in a Rocks glass. The reason is that a Rocks glass is made of sturdy glass which allows you to put more pressure into the glass without breaking it. Glasses that are tall, slim with straight sides are often referred as a Collins. The other siblings of this glass are the Highball and Delmonico. The difference between these 3 is the height. A Collins is the highest of them all, being around 12-16oz, while the Delmonico holds around 5-8oz and the Highball 8-12oz. For home use, a 12oz Collins glass is good enough to serve most cocktails in.